Terrain - Compacted sand and fine gravel. Difficulty - Easy to moderate with a few long, steady climbs. Highlights - Reaching the top of any of the long climbs. Suitable for - Mountain bikes, touring bikes, walkers and horse riders. 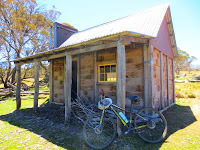 Websites and maps - The Great Victorian Rail Trail, Ride High Country and RailTrails Australia. Terrain - Mostly compacted earth with some paved sections. Difficulty - Easy, this is a ride or walk you can take the family on. The Darbyshire to Shelley section is more challenging. 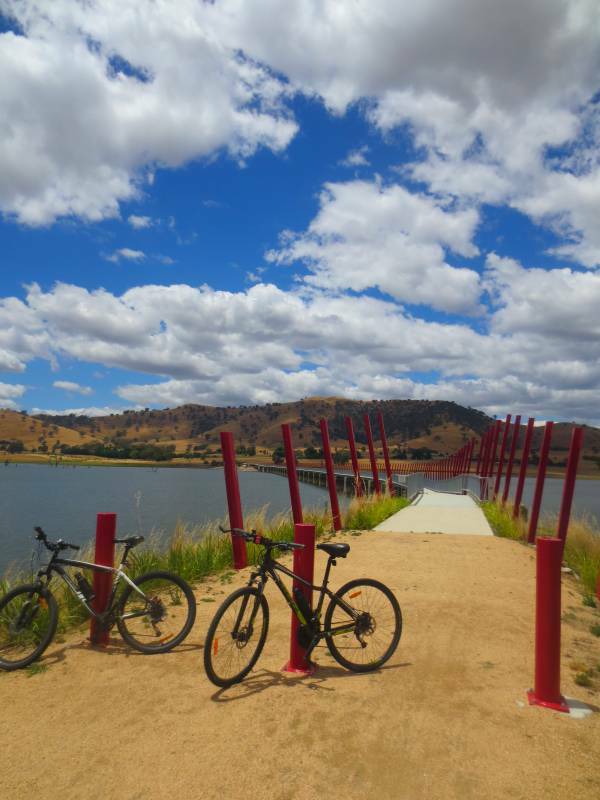 Highlights - Cycling across the beautiful Sandy Creek Rail Bridge. 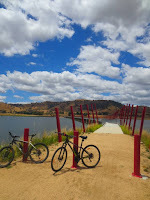 Extension - Darbyshire to Shelley - 22 km. Not contiguous with the rest of the trail. You'll need a mountain bike for this section. I admit it - I am a wildlife tragic. I'll go almost anywhere to see animals in the bush. David and I first visited Raymond Island in March but we were drawn back on the way home from our last road trip. Only four hours drive from Melbourne, at last count the 7.6 sq km island had a koala population of 307, making it the best place in Australia to see koalas in their natural environment. The island is a two-minute ferry ride from Paynesville in the Gippsland Lakes District of Victoria - a reliable place to see kangaroos. Paynesville and Raymond Island are the perfect wildlife tragic's double act. You can read where to find the kangaroos at Paynesville by clicking - here. For my March blog post on Raymond Island, with practical information as well as a description of our visit and lots of koala pictures click - here. Raymond Island, Victoria - the best place to see koalas in the bush. Raymond Island is a small island in the Gippsland Lakes District of Victoria. 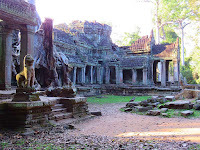 It is 7.6 sq km and has a population of about 550 people. The only access is by boat or car ferry. In 1953, 42 koalas were re-located there from Phillip Island as part of a conservation program. They took to their new home so well that today their numbers must be managed to prevent over-population. At last count, in 2013, there were 307. Yesterday we visited Raymond Island. I was in koala heaven. Without a doubt this is the best place I have ever found to see koalas in the bush - and I feel like I have spent half my life looking. The only other places which come close are a few of the campgrounds along The Great Ocean Road. Falls Creek Cycling - The Historic Huts Trail. Distance - About 40 kms return - you can easily make this longer or shorter. 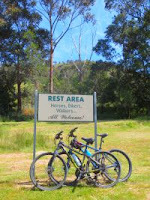 Terrain - Mountain bike trails - not suitable for road bikes. 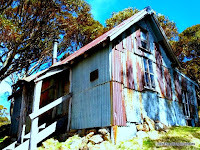 Difficulty - Moderately difficult, especially if you return via the Bogong High Plains Rd. Highlights - The lovely scenery along the aqueducts combined with a sense of total isolation. The Great Ocean Road - koalas, kangaroos, emus, UFOs and one of the world's great drives. If there was a prize for the most blogged about attraction in Australia, Victoria's Great Ocean Road would win hands down. I skim, glance at and read a lot of travel blogs and just lately every third blogger on the planet seems to be writing about the Great Ocean Road. I confess that I have blogged about it myself a couple of times. If you want to have a read click - here - and -here. A bridge too far - or maybe not! Our first rule of cycling is "find a cycle path separate from the road". Our second rule is "make it a flat one". You might think that Alps and 'flat' are mutually inconsistent but, strangely, in Victoria they are not. It is possible to do all the hard work in the car, then unload the bikes and cycle along the tops of the ridges through magnificent scenery and spectacular views. Hot again! Back to the High Country. This time we made it to Hotham. We parked the car at Whiskey Flat - what a great name! - and continued on from where we turned around. The trail became a lot easier but we were never going to be able to do it in one go starting as late in the afternoon as we had. The Great Ocean Road is 243 kilometres of National Heritage listed road on the south-east coast of Australia. Built by returned soldiers between 1919 and 1932 it is the world's largest war memorial - dedicated to the dead of World War I. In the early evening on October 21, 1978, Frederick Valentich left Melbourne's Moorabbin airport for a flight to King Island in Bass Strait. Valentich was a 20 year old pilot flying a Cessna 182L. At about 7 pm he was just off the coast at Cape Otway when he and his aircraft disappeared. In the minutes leading up to his disappearance he was in contact with Melbourne Flight Service Control. Having asked the controller whether there were any military aircraft in the vicinity, he described a large object which he said was "playing some sort of game".